Longtime Wilbraham resident Maureen P. (Ashe) Rizzolo, 81, died peacefully on Sunday, December 2, 2018 at Baystate Medical Center. Born in Springfield to the late Patrick and Margaret (Collins) Ashe, she was a graduate of Bay Path College. She worked as the Health Service Administrator for Teamsters Local #404 for 35 years until he retirement in 2000. As a young woman, Maureen loved to Irish step dance with her sister Patsy, spending her weekends in Maine where she loved to deep sea fish and traveling with her husband. She also loved a warm lobster roll while at her home at Cape Cod and spending Christmas Eve’s in the shed. Her laugh was contagious and she loved to cook her special recipes. In her golden years she watched Jeopardy, where she’d always answer the questions before the contestants, enjoyed classic BBC and Turner Classic movies, televised Sunday Mass, a good book and sharing luncheons with her friends. She spent her evenings on the phone, sipping her Manhattans, which she called her “medicine”, while shopping on QVC for her family. Most of all, she loved her family and spending time with them. Her family had many affectionate nicknames for her; Doni, Yanny, Peaches and Auntie Patsy’s adorable little sister. She was loved by all who knew her and will always be greatly missed. Maureen was predeceased by her husband Donato Rizzolo, step daughter Donna, former husband Donald Nelson and their daughter Mary Lynn Andrews. 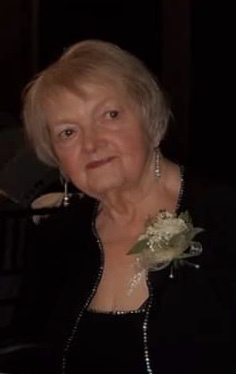 She will be sadly missed by her son James J. Nelson and his wife Julie of Pittsfield, sister Patricia Knowlton and her husband William and their children as well as her six beloved grandchildren: Meghan and her husband Ramzy, Shannon, Leanna and her husband Jeff, Jared, Erika and Ashley. Visiting hours for Maureen will be on Saturday, December 15th from 9 - 11AM at Wilbraham Funeral Home, 2551 Boston Rd., Wilbraham, MA 01095, with a service immediately following at 11:00AM. Her burial will be held at a later date in the MA Veterans’ Memorial Cemetery. In lieu of flowers, memorial contributions may be made to St. Jude’s Children’s Research Hospital, 501 St. Jude Place, Memphis, TN 38105-9959. Heaven has gained an angel.